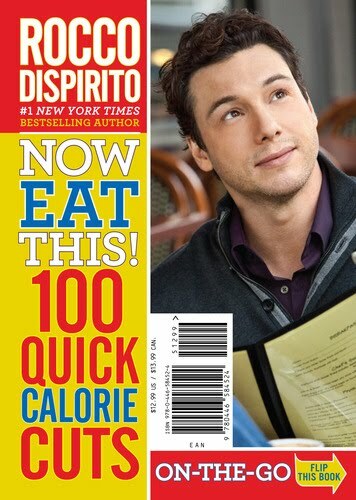 The central message of Rocco Dispirito's latest book, "Now Eat This! 100 Quick Calorie Cuts" is that in order to lose weight you need to reduce the calories you consume and that these reductions need not be several hundred calories at a time. Often it is easier to make small changes to your diet. How? Canadian, or turkey bacon in place of regular bacon saves you 52 calories. Ultra light beers, such as “MGD Light 64tm,” are as much as 85 calories less per 12 ounce bottle. A quick and easy read, the book is divided into two main parts: calorie cuts at home, and on-the-go. Between them is a fast-track weight loss plan, and a more long term healthy eating plan, both with corresponding shopping lists. More on those, later. Remember, if you cannot see yourself happily making any change indefinitely any weight lost consequent to that change will be temporary. For example, Rocco's suggestion of using a zero-calorie condiment brand is something I would never do. Why? I’ve tasted many of these products and to put it nicely, they’re awful! I also wouldn’t eat pumpkin pie without crust because pie isn’t pie without crust. What would I do? I would always measure the amount of oil I use, never skip breakfast, use applesauce instead of butter in a recipe, switch to lower fat cheeses, use Greek yogurt instead of full-fat sour cream on a baked potato. The important thing is to be consistent. Four ideas for calorie reductions caught my attention in particular. The first suggests you ask the person making your food to re-tool the dish you’ve ordered to have no more than 500 calories. Do chefs have the ability to tailor recipes on the basis of calories? The second: bring a brown bagged lunch from home instead of eating out. That’s right – a great way to cut calories when eating out is to not eat out. Rocco also suggests that eating out following his rules is a safe thing to do. While it's certainly part of life, I wouldn't want readers to believe that Rocco's advice truly makes eating out a healthful choice. Cooking meals from scratch as often as possible and eating together are important healthy eating habits. While I understand that people are going to eat out, don’t assume it’s healthy and conducive to weight loss – it’s not. Restaurant calorie amounts are very high and the more you eat out the harder weight loss will be. A better idea: pick up some frozen dinners to have on nights when you’re not cooking, you’ll save calories and money. The third: Pour hot sauce on foods. He cites a small study showing individuals who consumed capsaicin, the "hot" in hot sauce led to decreased consumption. Now if you like hot sauce, great, but even if you do, can you really pour it on everything? The fourth: Eating grapefruit before a meal will result in fewer calories consumed. Of course it's not grapefruit that's magical, it's eating a large, non-energy dense food right before eating. But what if you don't like grapefruit? Why not school readers on the value of any pre-eaten, low-energy density choice? The two-week fast-track plan has women averaging 1200 calories per day and 1400 for men. Will you lose weight at these calorie levels? Absolutely. Are you going to feel satisfied or will you be hungry and fatigued? That depends. Some women may be satisfied at 1200 calories, but most will need more. I've not yet met a man satisfied with just 1400 calories per day. The lifestyle plan, which is meant for long-term has women eating 1400 calories per day and men 1600. This will also result in weight loss for most but again, will you be satisfied? A better approach: Have the smallest number of calories per day that leave you happily satisfied, and don't worry about specific numbers or thresholds. Meal plans are great for giving you ideas and to act as a guide. But following them to the letter cannot be done forever. After all, what if you don’t want salmon and wild rice on day 9 for dinner? It's more practical to know how to build a balanced meal and count calories so you can make appropriate substitutions for your meals. In the end, if you pick up a few new tips that you’re able to implement and see yourself sustaining then this book may be worth picking up, but unfortunately the book has too many shortcomings for me to offer it a ringing endorsement.